You Save: $3.00 (20%) Ships in 1 day. Soft Cover, 144 pages, 7.5 x 7.5. There's more to brewing than waiting for the wort to boil. 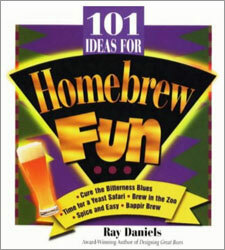 Author Ray Daniels offers 101 bizarre, interactive, and zany activities for homebrewers of all levels and anyone who relishes beer. Only Ray Daniels could have devised so many outrageous activities to celebrate beer and the art of homebrewing. His book is filled with fun ideas for social get-togethers, homebrew clubs, and individuals and is brimming with cool adventures and beermaking advice. Activities include: Brewing in wacky places, like the zoo, in an art gallery under a Picasso, at your local campground, or on top of the Sears Tower in Chicago Creating culinary delights with homebrew ingredients, like Malt Waffles, Spent Grain Cookies, Smoked Porter Cheesecake, and A Soft Spot for Pretzels Brewing weird beers, like Hobgoblin's Great Pumpkin Beer, A Jolly Ale for Old Saint Nick, Are You Porter or Stout?, Hard Cider That's a Snap, Mead from Heaven, and Sour Mash Beer And last but not least, grab your pith helmet, khakis, and petri dish for a yeast safari, and learn how to harvest thousand of different yeast strains. Ray Daniels, 1998 Beer Writer of the Year, is a well-known authority on homebrewing. Ray travels throughout the world teaching beer evaluation and appreciation. Author of the award-winning Designing Great Beers, Ray lives in Chicago.